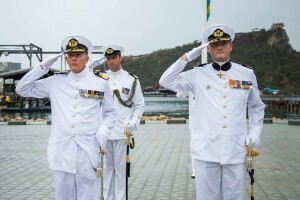 WILLEMSTAD - Yesterday, Commander Hans Lodder transferred his position as Commander of the Navy in the Caribbean to the Brigadier General of the Navy Peter Jan de Vin. The command transfer took place at the Parera Naval Base. Despite the pouring rain, the ceremony went smoothly. The new commander thanked in a speech his predecessor for his efforts over the last three years. De Vin announced that he wanted to use his term to strengthen the contact with all internal and external partners in the Caribbean. Governor Lucille George-Wout and other invitees were also present.